This mini compact stereo amplifier is designed to boost the line level output of audio sources such as TV audio, game consoles, MP3 players, iPad, CD player, computer etc with additional 20 dB boost. It helps intensify the maximum output level and provide clean sonic quality output through its boost in order to match with other sources. This amplifier supports connection with all different type of audio source equipments that output in RCA L/R, 3.5mm mini type or 5-Pin DIN type. The boost level or volume control is easily and manually adjustable from the rotary dial on the front panel. boosting the output from low-level audio sources such as tape player, potable CD player, MP3, TV or computer. correcting the sonic level mismatch issues that often cause portable players to be lower in volume than other home audio devices, resulting in distorted sound performance. increasing the sound level for mixer or speaker setup, karaoke, audio recording, party, live stage event. longer cable run between audio components. This unit can also be used to provide an external way of volume control for any audio source device or stereo amplifier that has no output level or volume adjustment of its own. A volume control dial for variable line level output is located on the front panel. Users can control the volume level from this mini amp directly. No more cranking the master volume control on the receiver or power amplifier at home or live event. 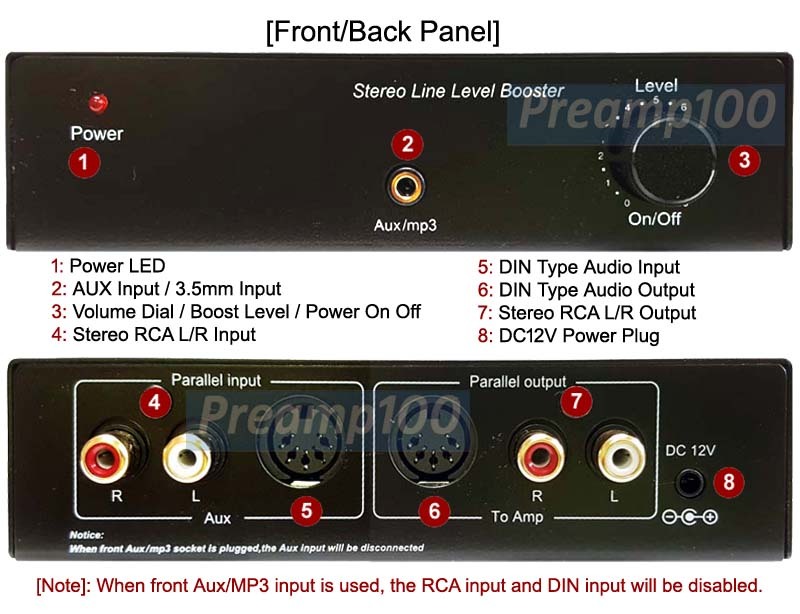 This pre-amp provides users with an excellent solution for matching the sonic level from iPod, MP3/MP4, iPad, Tablet, CD player and mobile devices with Hi-Fi system, audio receiver, computer, loud speakers. So no more distorted sound or noise heard from your stereo setup at home or office ! This mini amplifier provides up to 20dB boost for audio signal to be transmitted over long cable wire without loss of quality and overcome signal level losses caused the cabling. A great necessity when connecting the TV audio output or tape or CD player in living room to the stereo system located in family room. Premium preamp or mini amp with adjustable boost up to 20dB. Built-in high-end amplification circuits with ultra low-noise audio operation for outstanding performance. Boosting the output from low-volume audio sources such as tape player, potable CD player, MP3, TV or computer. Correcting the sonic mismatch issues that often cause portable players to be lower in volume than other home audio devices, resulting in distorted sound performance. Increasing the volume level for mixer or speaker setup, karaoke, audio recording, party, live stage event. Helping installation with longer cable run between audio components. 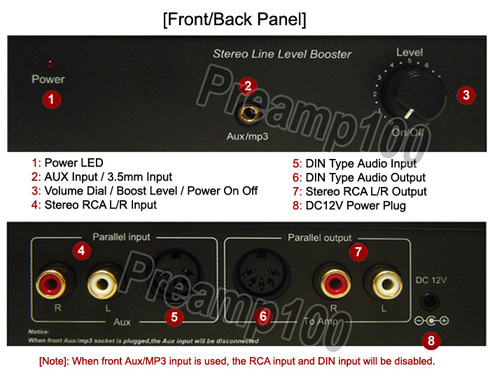 Adjustable gain to boost low-level audio inputs to the level needed to drive amplifier or receiver properly. Excellent solution for matching the sonic level from iPod, MP3/MP4, iPad, Tablet, CD player with Hi-Fi system, audio receiver, computer, loud speakers. Provides low-noise floor and high musical accuracy for listening and recording. Used as amplifier for karaoke players or CD/DVD player to transform your stereo music to thrilled sound for party or outdoor events. Provide an external way of volume control for any audio source device or stereo amplifier that has no output level or volume adjustment of its own. Compact and all-metal design for durability and shielding the electronics from electromagnetic interference with noise rejection. 110V AC/DC power adapter included.